The lovely Victorian peridot bracelet in the picture below is from the early 1800s. The bracelet consists of three cushion-cut peridots, interspersed with floral motif filigree sections, and bezel-set in rope motif birders in 12K yellow gold. The luscious lime-green peridot stone in the middle weighs 4.75 carats and measures 13.50 x 8.50 x 5.49 mm, and the other two peridot stones weigh 8.25 carats in total. 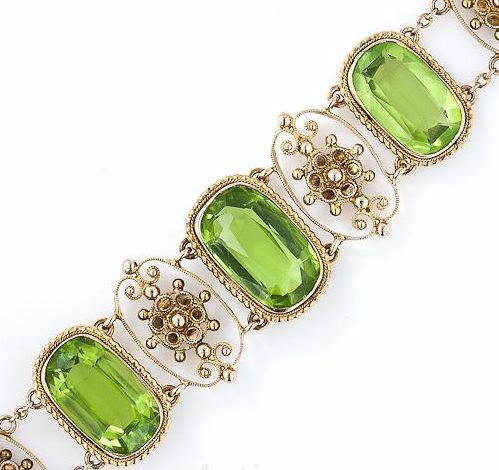 The beautiful antique peridot bracelet measures 6 ¾ inch (length) and 5/8 inch (width).